125s are being built by amateurs in their garages all over Australia. We are one of the fastest growing classes in Queensland and most of the boats are still built by either parents or the sailors themselves!! Last year we had four new Queensland boats launched and another two are close to completion. 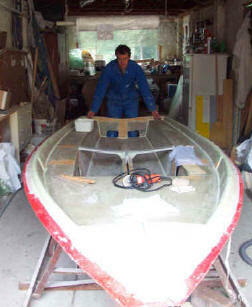 Most 125 hulls and decks are built out of fibreglass and foam sandwich, with the gunwales and trimmings made out of wood, although some boats are now all fibreglass. While it sounds complicated and expensive but it is really quite easy to do and cheap. Timber boats are a bit harder to build believe it or not, and also require a fair bit of regular maintenance. My fibreglass boat needs only the wooden gunwales and trimmings to have coat of varnish once a year!!! That's it! Foam sandwich boats are built by the following method using a mould or jig. There are two private moulds available in Queensland at a low cost for anyone to use. Your materials (We can provide a list and even provide the materials themselves). A 125 Rules and Measurement Guide (pdf). One set of mylar patterns. Available for hire from the 125 Association. (Most moulds come with patterns). The foam is cut into the sections of the boat using a set of patterns. The hull sections are then laid over the mould (which is an upside down hull on legs) and glued in place and then fibreglassed. Once dry, the hull (shell) is pulled off the mould and turned over and glassed on the inside. Tanks and seat tops are then glued and fibreglassed in place. Gunwales are glued around the boat. The centreboard case is made and fibreglassed into boat as well as other trimmings. The hull is faired, painted and rigged. The price for all the materials for a foam sandwich 125 hull excluding rigging and fittings is about $1500. This includes resin, glass, foam, wood, paint etc. ; i.e. everything for the hull itself. The hire of the mould is $100. Patterns from the 125 Association need a $40 deposit (Refundable). John Anderson has built five 125s and helped with many more over the years. He can provide help and advice on the construction and getting started as well as information on fibreglass and foam construction for people who have never used it before. In other states, enquiries regarding plan sets should be directed to the National Measurer or President. International (ie outside Australia) enquiries should be directed, via email, to the National Measurer or President.